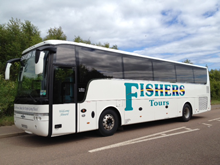 Fishers Tours is a local family owned coach hire company based in Dundee, Scotland. Our large fleet of coaches are available to hire for all occasions from school and nursery group outings to VIP travel (and everything else in-between!). Our friendly and helpful staff are ready to serve our customers whatever their coach transport needs. Call us today on 01382 227290 (option 2). All vehicles are fitted with seat belts for the comfort and safety of our passengers, and are available to hire for everything from short local trips to extended tours, depending on your requirements. Safe, Comfortable, Reliable Transport Tailored to Your Requirements! Hiring a bus or coach from Fishers Tours means that you and your party have the flexibility to go where you want and when you want. Our professional and friendly drivers will conduct you safely to your destination, ensuring you have a comfortable journey with convenient stops and pick-up points. You can sit back, relax and enjoy the scenery when you hire a bus or coach from Fishers Tours! Book Your Coach Hire Today – Call us now! For competitively priced coach hire in Angus, Dundee, Fife and beyond, call us today on 01382 227290 (option 2), or send us an email to enquiries@fisherstours.co.uk and we’ll be delighted to provide a quote for safe comfortable travel tailored to your exact requirements. Call us now to find out more. Lines open Monday to Friday 9.00am – 12 noon and 1.00pm – 5.00pm.